The Crimini/Baby Bella mushroom is one of the tastiest mushrooms ever grown. It is very versatile in its uses. Crimini/Baby Bella are Portabella Buttons. 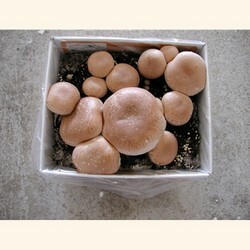 They are very solid button mushrooms and can be left to grow in to a Portabella if not picked. Not all crimini/baby bella's will become large Portabellas some may stay small, if left to continue to grow. See other descriptions and information below. Mushroom kits come in 2 sizes 12lbs. and 6 lbs., pricing and outer boxing options, maybe viewed below. Shipping charges are calculated at time of check out. The Crimini / Baby Bella mushroom is one of the tastiest mushrooms ever grown. It is very versatile in its uses. When harvested young in the button stage it is called a crimini or baby bella and can be used in the same way as the regular white button mushroom. When harvested as a mature mushroom, with the gills exposed, it is called a Portabella. One of the nicest features of the Crimini is its high solid content. The Crimini / Baby Bella is probably 50%higher solid content than the white button mushroom. This unique feature makes this mushroom a meaty and wonderful mushroom to cook with. Crimini / Baby Bella caps can grow as small as 1 inches across to as large as 2-3 inches across, with the average size being 2 inches in diameter. These mushrooms when cooked can taste similar to eating meat and is often used as a meat substitute. Our mushroom kit grows several crops of these delicious mushroom. The first two crops are usually very large almost filling the box with mushrooms. The third crop is fairly big as well. The subsequent crops after that get smaller fruiting in clusters and lesser amounts, until the mushrooms finally stop. No matter what they are called they taste great. The kit is complete all you add is water. Kits are time sensitive and should be started within 10-21 days after there start date. Start dates can be delayed if the kit is refrigerated. These mushrooms are grown on pasteurized compost and do not smell. All mushroom kits can to some degree attract small fungus gnats this is normal. Shipping charges are calculated at time of check out. Mini Kit Dimensions: Length 9.5",Width 7.25",Height 7.5". Mushroom Kit Shipping Weight: 12lbs. / Grows up to 4 lbs of mushrooms total. Started 10/31/17 it is now 12/27/17 and still NOTHING!!! This is really a lot of fun to grow! Not hard at all to follow the included instructions, and our little box o' shrooms grow so fast once they get started! VERY tasty too, it is so nice to have fresh mushrooms on our salad and such. My first batch I sauteed with some shrimp and it was awesome!